Fetal urinary tract obstruction can result in renal dysplasia, oligohydramnios, and pulmonary hypoplasia. Various surgical approaches have been used to create a complete obstructive uropathy though with variable success particularly in female fetuses and significant mortality in both males and females. Our objective was to create an improved ovine obstructive uropathy model in both male and female fetuses during the second trimester to study lung hypoplasia and renal function. Ewes (n=20) at 90-100 days gestation (term=140-145 days) underwent hysterotomy. 45% singletons, 55% multigestational. One fetus per ewe underwent creation of obstructive uropathy (9 males and 11 females). In the male fetus, a paramedian incision is made below the umbilical cord and the urachus and distal urethra are ligated. Females require two incisions. One midline incision made at the pubic symphysis to ligate the proximal urethra and a second in the midline below the umbilical cord to ligate the urachus. Serial ultrasounds are performed and fetuses are sacrificed between 130-135 gestational days. Ultrasounds confirmed bladder distention, hydronephrosis, and fetal viability. Mortality occurred in 5/20 (25%) from fetal demise. Successful completion of the model at necropsy demonstrates a grossly dilated bladder, multi-cystic kidneys, and small lungs (Figure 1,2). 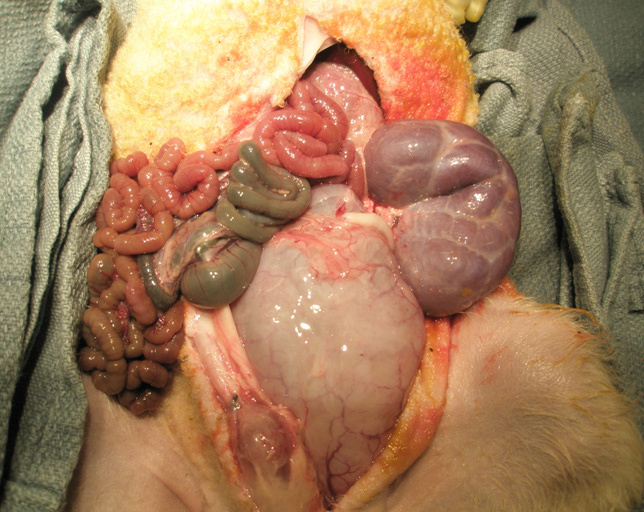 We demonstrate a successful complete obstructive uropathy model in male and female fetal lambs. Differing techniques are needed due to anatomic differences and allow for minimal fetal trauma. This refined ovine model has utility in studying potential fetal interventions in decreasing the mortality from renal dysplasia and pulmonary hypoplasia. Figure 1. 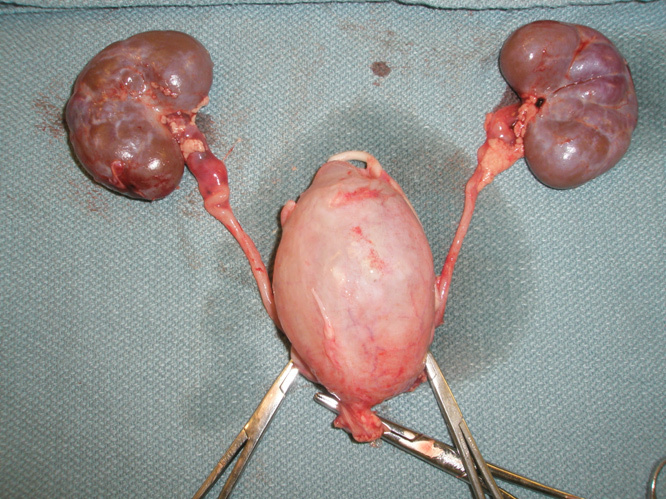 Necropsy of obstructive uropathy in a male fetus at 132 days showing a dilated bladder and multicystic left kidney. Figure 2. Dilated bladder, hydroureters, and multicystic kidneys.